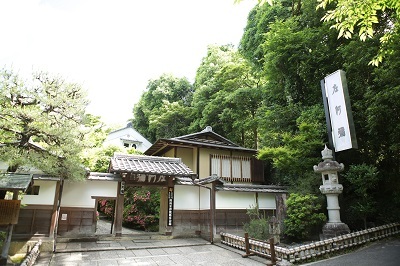 It was founded in 1849 (Kaei 2nd) by Yorinaga ODA, a nephew of Nobunaga Oda and both its refined garden and building are filled with authentic ambience. Relaxing table & chair setting. We will hold a “Bridal Fair” at Saami (ryoutei restaurant). 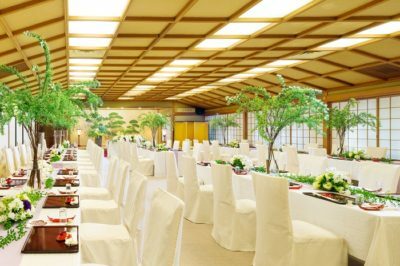 Saami is a traditional Japanese restaurant (=ryoutei) and very popular venue for the wedding reception after the couples get married at shrines or temples, or Nijo Castle. Contents : Presentation of the room decoration and table coordination. Proposal of the wedding reception and costume (kimonos) with traditional Japanese taste. Tasting of “Kyokaiseki dishes” which are served at the actual wedding reception (5,000yen/person). Exquisite “Omotenashi” hospitality you may only experience at “ryoutei”. Please do NOT miss the opportunity!